Legacy staff Leila Baz and Khaled Hassouna traveled to Kyrgyzstan last month to interveiw finalists for the Kyrgyz Women’s Leadership Development and NGO Capacity – Building Program. The project is designed to positively impact emerging professionals (community leaders, political leaders, educators, and youth workers), and to strengthen grassroots organizations. Twelve Kyrgyz women and eight U.S. delegates comprise the initial exchange groups. Kyrgyz finalist were selected and will travel to the U.S. later this year. 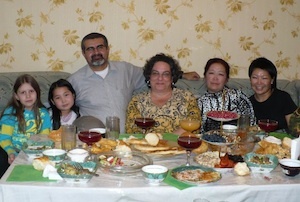 While in Bishkek, Leila and Khaled also reconnected with alumni from several previous regional programs. The city of Osh is getting ready for Nourz, the first day of Spring. A yurt is being put up near the main square in the city.